Nikolai Tcherepnin (1873–1945), a student of Rimsky-Korsakov and teacher of Prokofiev, was a Russian-born composer and conductor, and the first of his family’s musical dynasty. This CD provides a conspectus of his ninety-plus songs, which cover a wide range of styles. The early ones are in a late-Romantic idiom,; the Japanese Lyrics of 1923 display oriental colours, and the extraordinary Oceanic Suite (1917–23), which sets a series of incantations by the symbolist poet Konstantin Balmont, are modern evocations of primitive ritual. 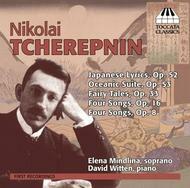 An earlier Toccata Classics CD of Tcherepnin’s piano music, played by David Witten, was described by James Harrington in the American Record Guide as ‘finely crafted music that is always interesting. I cannot imagine a better, more complete introduction to a relatively unknown composer’. Elena Mindlina hails from Saratov, Russia. After taking a master’s degree at the Saratov State Conservatoire, in 2006 she came to New York to study musical theatre at the American Musical and Dramatic Academy in Manhattan and has since appeared on stage in operas (including Boris Godunov), operettas (The Merry Widow) and musicals (South Pacific). Baltimore-born David Witten is Coordinator of Keyboard Studies at the John J Cali School of Music at Montclair State University in New Jersey. His international career has included numerous concert tours in China, Finland, Ireland, Mexico, Russia, Ukraine and South America.